A petition calling for the UK to stay in the EU, which has amassed more than six million signatures, has been debated in Parliament. Two other petitions were debated in the Westminster Hall chamber. 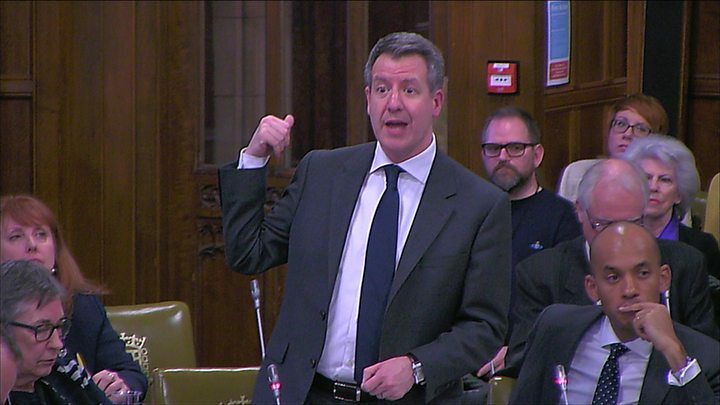 But MP for the Independent Group, Chris Leslie, called for the debate to be moved to the Commons, not "simply nodded through", as is customary in Westminster Hall. He told MPs: "It is now our duty, faced with this six million petition, to not have it pigeonholed and side-lined here in Westminster Hall, but to take those views and have that voice heard in front of the government. "Not just a junior minister, but the prime minister and senior cabinet ministers need to hear the voices of the people." The petition to revoke it was started in February and quickly passed the 100,000-signature threshold needed for it to be debated in Parliament. By 23 March, the petition had been signed four million times, at one stage causing Parliament's petition website to crash. During the debate, Labour's Catherine McKinnell said that "no petition has received the number of signatures this petition has". She said, while it "doesn't replace our normal democratic processes", it "simply is a reflections of level of interest in this issue and strength of feeling from the public". Ms McKinnell added: "We ought to be very grateful that they have their means to make their voices heard. This petition is a roar." Another MP for the Independent Group, Heidi Allen, used her contribution to call for a public vote on Brexit, saying it would be "healing" for the nation. "Involving the entire country in the decision... there can be nothing more healing than that," she said. "Everybody's voice is equal because that is a democracy." But Tory MP Julian Lewis used the debate to press for the UK to leave without a deal and to go onto World Trade Organisation terms. "I, together with 158 of my colleagues - more than half of the Tory party - voted that we should leave on WTO terms and I think that should be the right solution." The UK had been due to leave the EU on 29 March 2019, two years after Article 50 was triggered, but European leaders agreed to delay the date, after Theresa May failed to get her Brexit deal approved by MPs. The European Court of Justice (ECJ) ruled last year that the UK could revoke Article 50 itself, without having to ask the other 27 EU countries for permission. In 2016, after the UK voted to leave the EU, by 52% to 48%, in the referendum on 23 June, a petition for another EU referendum attracted more than four million signatures and was debated in the Commons - but thousands of signatures were removed after it was discovered to have been hijacked by automated bots. In January 2019, MPs debated whether the UK should leave the EU without a deal, after a petition calling for that reached 137,731 signatures. People signing petitions on the website are asked to tick a box saying they are a British citizen or UK resident and to confirm their name, email address and postcode.